I was fortunate enough to be a tech mentor for the first batch of NYCGenTech. It's a program by the City to create the next generation of technologists and tech entrepreneurs. To be honest, my involvement with the program actually inspired the character of Pocholo in "An NYCDataWell story." I can't help but imagine what a future NYCGenTech batch would do with an NYCDataWell, or something like it. Scratch that, what all NYC students can do by using the NYCDataWell to do all kinds of experiments, not just the fortunate batch of 30+ students that joined the pilot program. Students as City Researchers. With local schools, CUSP, and the City itself designing experiments and deploying them on the Launcher App for data-gathering. Once a City Positioning System is deployed, one very interesting usecase that should be on the shortlist is the Quantified Commute. Through the NYCDataWell Launcher App, a user can register Work and Home locations as well as the timings of the typical workweek schedule. With enough users, the MTA can really do super-efficient allocation of transportation resources. And with the City Navigation System enabled and powered by the CPS, the City can even do proactive notification and re-routing as illustrated in the NYCDataWell Story when the Dad was automatically notified of a changed bike route when the City's emergency services had to close down a section of Broadway. This usecase alone, in our opinion, justifies the installation of a City Positioning System and makes a compelling case for something similar to the DataWell. Every New Yorker has a Sandy story. When the power went down, it became abundantly clear how dependent we are on modern technology. So how can NYCDataWell, yet another piece of modern technology dependent on electricity, help out in something like Sandy? With that addressed, let's imagine now an alternative version of the Sandy evacuation. 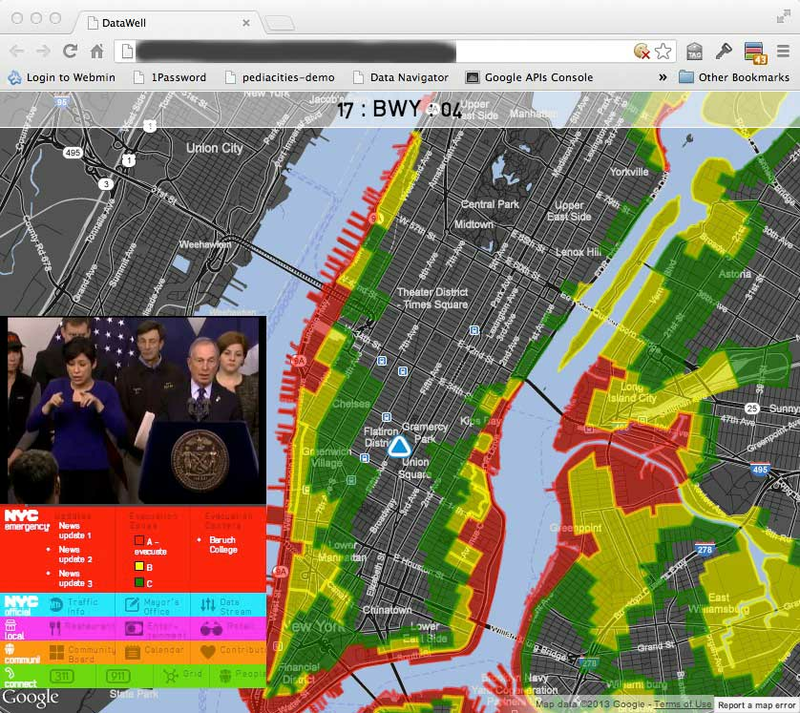 When Mayor Bloomberg called for the mandatory evacuation of Zone A, wouldn't it have helped if DWs connected to a display can show that information in a hyperlocal context? That's exactly what Miguel prototyped here. While walking around the City during one of our many Reinvent expeditions , we noticed things that we haven't paid attention to before. First of all, we were surprised how many payphones there still are. None of us can remember the last time we used one. To us, they were billboards that happen to make calls. We also noticed that the City took pains to preserve the look of certain neighborhoods. Union Square for instance. It still had traditional lampposts. And even modern additions, like the Digital Display on top of the subway station entrance, were camouflaged not to draw attention to themselves. And that's one reason why we went for modularity and chose to even have a bare-bones, plate-only configuration. In Union Square, we envision several plate-only DWs talking wirelessly to mated devices. Why, the City can even go for a "nostalgia" deployment that uses a turn-of-the-century phonebooth instead of the modern pole configuration we designed. Perhaps, an NYCDataWell sticker, similar to the ubiquitous Wifi stickers can be used to let people know that DW services are available even in an unconventional, camouflaged location. During one of our Reinvent Thursday earlier this year, we were brainstorming the dot.Community Bulletin Board usecase. And John came up with this example, which is now a recurring joke in the team - "Gluten-free Guitar Lessons". Public Service Announcements. With the current payphone contract, 3% of advertising space is saved for the City to share information with the citizenry. 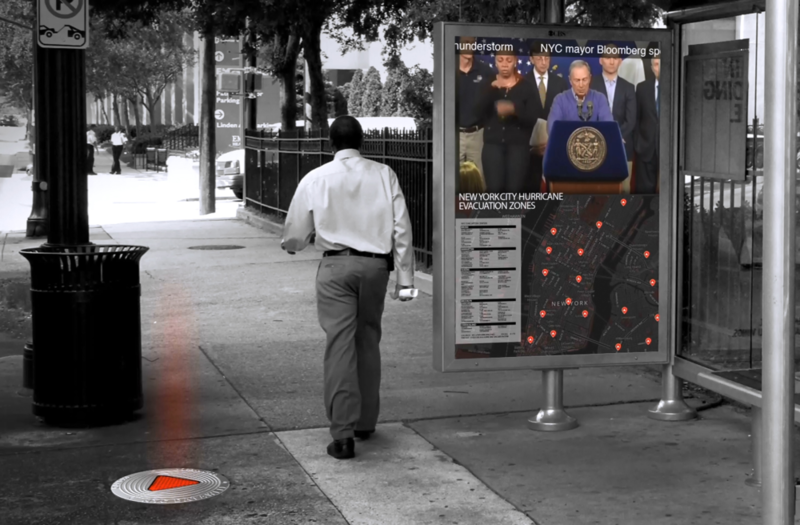 With the NYCDataWell, why not rotate PSAs more? And why not personalize it? Last week, I was riding the subway and saw a PSA poster saying that a 20 oz soda will require a typical adult to walk from Times Square to Yankee stadium to burn off the calories. With a Personalized Service Notification, maybe my current profile (age, gender, typical commute route) can be used to make the calorie calculation more relevant. I couldn't find a digital copy of the poster, but here's a YouTube ad from the same "Pouring on the Pounds" campaign. The City keeps P.A.C.E. (Primary, Alternate, Contingency, Emergency). 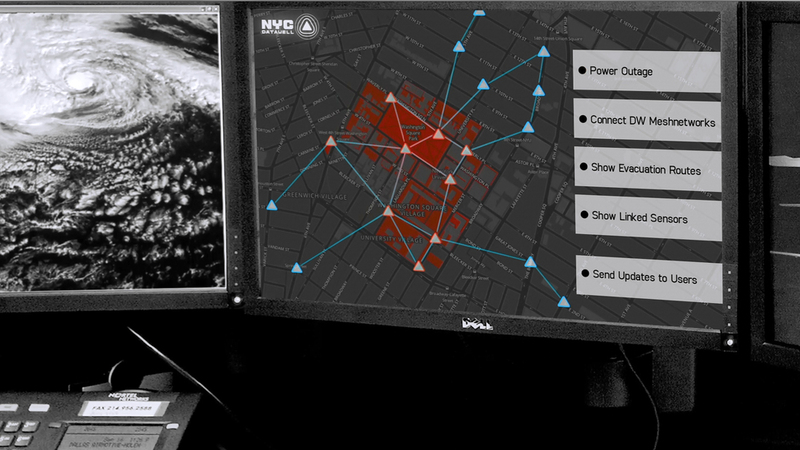 Mesh network connectivity is not as fast but is activated in extended emergency mode as High Speed Internet Access becomes unreliable in the city. At strategic points throughout the City, hardened DWs with extended capabilities (pole doubles as antennae, extended battery backup, local caching/staging of content) acts as relays. Some rooftop mesh routers with good line-of-sight access are also activated. Select rooftop routers use microwave connections to DoITT to ensure ample bandwidth. The network can be supplemented by deploying mobile mesh routers. All City Agencies are hooked into the network with prioritized access given to city personnel. 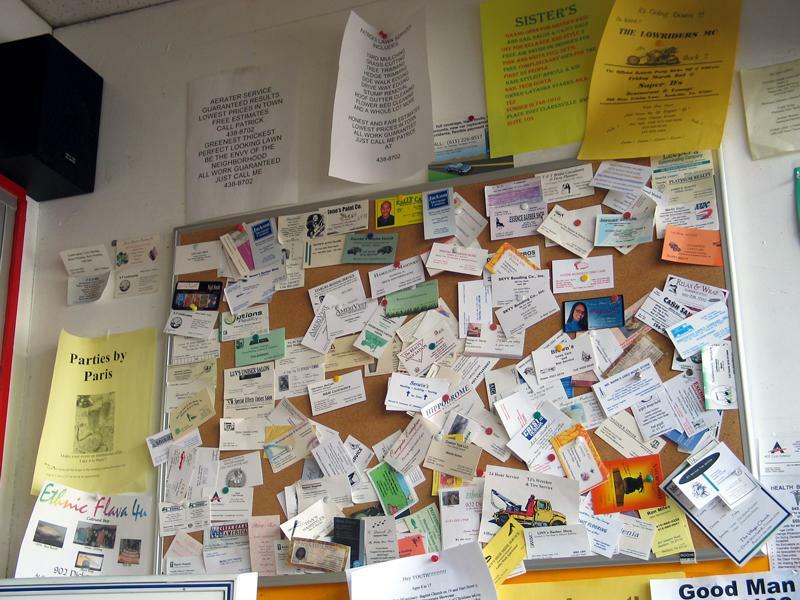 There are 59 Community Boards across NYC. 12 in Manhattan, 18 in Brooklyn, 12 in the Bronx, 14 in Queens and 3 in Staten Island. 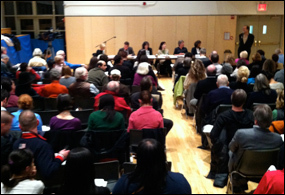 Community Boards are the most accessible component of NYC city government and are the main advocate of their community's residents. Why not arm these volunteers with hyperlocalized actionable information to make them more effective advocates? And not just advocates. With proper training, Community Board members can better harness local volunteer resources to become effective partners of the City. dot.Community Bulletin Boards. Smart electronic bulletin boards that leapfrogs Craiglist and combines the familiarity of the Bulletin Board at your local grocery. It can even allow Mom and Pops to place targeted ads. Something that they cannot do with the existing payphones which are too expensive for the local store. And why not give authenticated, local residents some escalated privileges so their listings get preferential access? ESTEEM is a take off STEM. Science, Technology, Engineering, Math. To STEM, we add Enterpreneurship and Environment/Society, making for ESTEEM. What if we make public school education more relevant by allowing NYC students to become junior civic hackers like Pocholo in the NYCDataWell story? Not only will it make their education more relevant (they're interacting with Open Data relevant to where they live), they're contributing to their neighborhood while exploring kidpreneurship. Joel explores this in more detail here. As the Tidy Street Project demonstrates, giving hyperlocalized signals to the citizenry gives them the necessary information to modify their behavior for the better. Instead of doing this for one block for two months, why not do it at scale for the whole city? Maybe by creating a parameterized actionboard (an actionable dashboard) that citizens can always refer to, and can even be displayed as Neighborhood Service Announcements (hyperlocalized Public Service Announcements) at the corner DW? And even celebrate blocks that top the rankings, giving a feedback loop to local residents. Infographics and other visualization techniques have allowed the general public to better understand data. What if we use the NYCDataWell to create not only dynamic, hyperlocalized infographics at the street level, but also InfoStreetArt?